An unsuspecting member of the fleet has been brought under the control of Imperious Leader. As stated above, this story appeared in thirteen issues of Look-In, a UK magazine geared towards kids. The story is told in comic strip form and appeared in two-page chapters of each issue. The story itself is untitled. I borrowed the title "Time Bomb" from the Battlestar Galactica Chronology on the Look-In wiki (this site was also the source of the writer and artist on the story). I've chosen to place this story during the break between Realm Press' published issues of the so-called seasons two and three of BSG. It is during this time period that Baltar is missing (having escaped incarceration on the prison barge in "Prison of Souls" Part 3, but not yet having returned to the Cylons), so it makes sense that we see the Imperious Leader plotting the clandestine attack seen here. On page 1 of the story, Athena reports that she's received an emergency communication from Number Eighteen, which Colonel Tigh indentifies as an old Valnic-class freighter. It's not clear whether "Number Eighteen" is the name of the ship (possibly as part of a larger corporate fleet of freighters) or a designation assigned it within the rag-tag fleet. It does make some sense that the ships of the fleet might have been assigned numbers by Commander Adama and his staff to help keep track of them in a manner easier than simple ship names; if so, it suggests that each ship of the fleet has a designated number. This identification scheme also seems to be in effect in "Beautiful Mirage". On page 1, Tigh remarks there are 300 passengers on Number Eighteen. Later chapters of the story suggest 400. On page 1, panel 5, Starbuck is playing a game of cards and the cards are rectangular instead of the hexagonal ones normally seen in a game of pyramid. 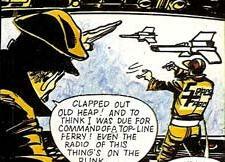 On page 2, panel 4 of the story, one of the crew of Number Eighteen is wearing a jacket that has words on the back. Possibly it says "Space Freight" since he appears to have a shoulder patch with the stylized letters "SF" on page 4. On page 3, panel 7 of the story, Boomer seems to be depicted as white! 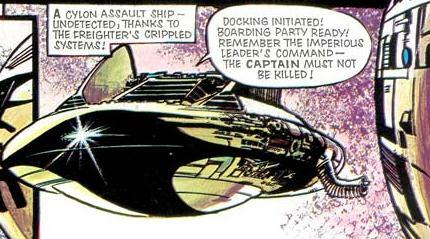 A ship referred to as a Cylon assault ship appears on page 4 of the story. 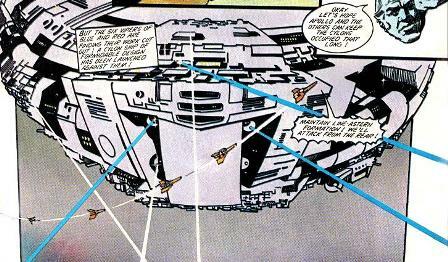 Page 5 of the story suggests that the Galactica shuttlecraft are called scarabs. 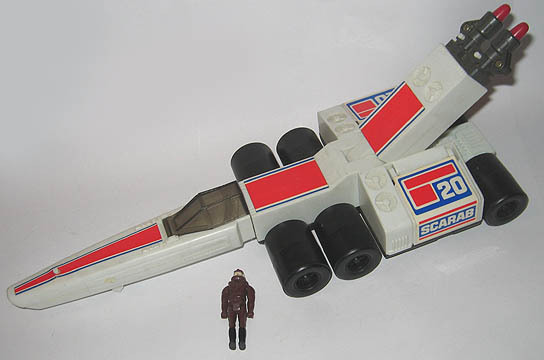 In the BSG toy line produced by Mattel, the scarab was a land vehicle with an aerial assault gun and Viper-type cockpit. Regaling Boxey with stories of his youth, Captain Heffren mentions working a boat on Lake Karkk on the Ninth Colony. Is "Ninth Colony" meant to be a secondary name for one of the Twelve Colonies? If so, then each Colony world presumably had its own number designation 1-12. On page 12, panel 5, a Viper pilot's dialog is mistakenly given to a Cylon Raider! The Viper/Raider dogfight on page 12 of the story takes the lives of two previously unknown Colonial Warriors (from Green Squadron) named Skinly and Mackay. Why do Commander Adama and Colonel Tigh investigate the situation in the fuel room personally, as seen on page 15 of the story? They're much too valuable on the bridge considering there are plenty of security personnel to send instead. Obviously, Adama is personally concerned for his grandson Boxey's safety, but even so, guards should have accompanied them in the first place. 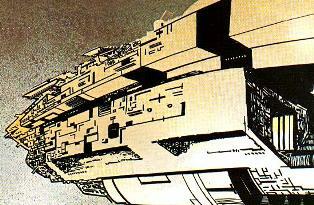 On page 20 of the story, we see another unknown type of Cylon ship, large and heavily armed. Judging from the dialog by the Imperious Leader, it seems the ship was launched from his basestar, but it appears too large for that, almost as big as a basestar itself. How did the Cylons know where to go aboard freighter Number Eighteen? They knew where the refugees were housed and where the command crew was located. Why have the Colonials seemingly not seen the large Cylon warship in this story previously? Or since? How did Commander Adama know that sending the impulse microvator to the Cylon ship would cause the ship's destruction? Imperious Leader's plan could just as easily have been to have Heffren ignite the tylium fuel on Galactica manually. Did Adama have any particular reason to think an electronic burst would be sent to the microvator to trigger the explosion? And if the Colonials had the means to deliver a powerful missile to a crucial point of the Cylon ship, just as they do here, why not blow the missile themselves...and at some time before this to boot?! If the Cylons have a device such as the impulse microvator, which allows the Imperious Leader to telepathically manipulate an implanted human, why do they not use it again in later stories?